A new Christian group was launched last week in Kuala Lumpur amidst much fanfare and more than the usual coverage from government media. Christians for Peace and Harmony Malaysia (CPHM), led by the Reverend Wong Kim Kong, a former Secretary-General of the National Evangelical Christian Fellowship, aims to promote peace and harmony in Malaysia, encourage moderation and bridge the divide between Christians and the government. Anyone who is familiar with Malaysia will know how badly we need to promote peace and harmony in Malaysia and how much we need to encourage moderation and dialogue. By all counts such a group should be a welcomed addition to the ranks of the many NGOs fighting to make Malaysia a better place for all Malaysians. And yet, many Malaysians have panned the group sensing a hidden hand with a hidden agenda at work. It is not hard to understand why. Take the glitzy launch of the group, for example, which was held at the Majestic Hotel, one of the most exclusive hotels in the country, with over 1200 people attending. It must have cost a small fortune. When was the last time a major Christian group, leave alone a start-up group, able to afford such extravagance? 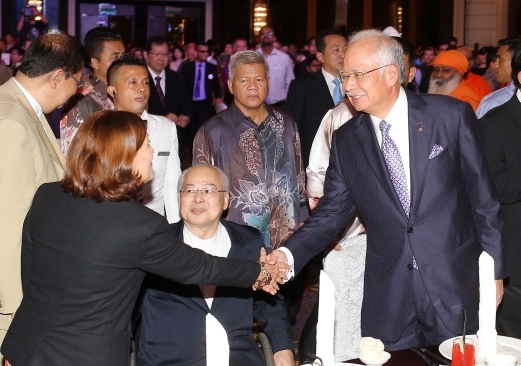 And then there was the presence of no less than Najib Tun Razak, the Prime Minister himself, at the launch. Already under heavy public criticism for a whole range of misdeeds, the launch provided him with just the right platform to burnish his credentials. Rev. Wong, for his part, lavished praise on the prime minister and hailed him for his leadership. He also pleaded for Najib to be given the chance to prove his good intentions. Najib has been in office since 2009. During that time, Malaysian Christians have come under ever-increasing pressure from both extremist groups and government agencies themselves. Churches have been attacked and raided; bibles have been banned; the height of crosses have been scrutinized and Christian events made out to be seditious. Christians have been vilified, threatened and accused of undermining national security. And government officials treat churches and Christian events in an arbitrary and discriminatory manner without regard to constitutional rights and guarantees. Just last week, officials cancelled a Christian event without explanation after Muslim groups complained about it. Christian leaders have met with Najib on a number of occasions to appeal to him to uphold their constitutional rights. The results have always been the same – great speeches, stirring promises but little or no effective action. Rev. Wong undoubtedly knows all this but he pleaded that we “forgive and forget.” Of course, Christians ought to forgive, but to pretend that all will be well because of another speech is disingenuous at the very least. Besides, how can we forget while our country sinks deeper and deeper into the abyss of corruption, misgovernance and despair? CPHM also says that there is an urgent need to rebuild interfaith ties at the grassroots level and for Christians to engage other faith communities. Such moves are, of course, useful but again, it very conveniently ignores the fact that much of the racial and religious discordance that we are experiencing today arises out of the deliberate manipulation and political exploitation of religious and racial issues by those at the top. And that is where efforts to promote peace and harmony should be focused. Rev. Wong’s agenda became all the more suspect when he went on to invoke Scripture to urge Christians “to submit to and obey the government and those God has put in authority.” That comes pretty close to bestowing upon the Najib administration a divine mandate to carry on with its self-serving and undemocratic rule. This is not biblical respect for authority but acquiescence of injustice. Not content with the malappropriation of Scripture to support a morally bankrupt regime, Rev. Wong also made the asinine assertion that there was actually greater freedom of religion in Malaysia than in the United States. No doubt he also believes the government view that Malaysia has the best democracy in the world! On top of that, he appeared to chastise “overzealous Christians who share the good news,” lamenting that “every religion has this type of people” and assuring everyone that “by and large Malaysian Christians are not extremists.” It must have been music to the ears of the real extremists in Perkasa and ISMA who are always looking for excuses to justify their hostility towards Christians and minorities. Oh, and by the way, the president of Perkasa, who normally wouldn’t touch anything Christian with a ten-foot pole, was a special guest at the launch of CPHM. It might be tempting to think that perhaps Rev. Wong and his team might be trying to defuse a politically charged situation in order to lay the groundwork for negotiations and compromise. However, given his own admission that he intends to avoid most of the critical issues that have caused so much angst among Christians, that seems unlikely. What we are left with then is the inescapable conclusion that this is but a crass attempt to politically manipulate the Christian community into supporting a government that has done nothing to deserve it. Another thirty pieces of silver story?